In February1802 a small group of mostly Scottish families sailed from England on the Coromandel. They had come to London from the Scottish border country, casualties of the movement which enclosed the small, tenant farms where their families had worked over generations. Promised land and other material assistance on arrival in Sydney, these families chanced their future on a long sea voyage to the Antipodes. For most at this time, Australia was a place of exile. The Coromandel families, however, planned to settle there permanently as free settlers. Having experienced feelings of alienation in England, where their rights as citizens were restricted, Australia offered them the freedom to practise their non-Conformist religion. Although completing a non-stop voyage to the colony and thus significantly reducing the trip’s duration, the Coromandel’s voyage was not without problems. It was fraught with bad weather, threats of convict mutiny and the deaths of two of the group’s members. Reaching Sydney in June 1802, the group eventually settled in the remote, fertile, flood prone Hawkesbury region of the colony at Portland Head. Their farms were situated on both sides of the river, in what to them was an unfamiliar and sometimes threatening environment. Their skills in trades such as carpentry and their coming from a farming background, assisted them in establishing and working as a viable community. The importance placed on their religion soon saw the establishment of a church. This place of worship, called Ebenezer, was possible through the donation of land and the community’s willingness to subscribe generously to and be actively involved in its construction and maintenance. By 1809, a two-roomed building was completed. Fashioned from locally quarried sandstone, the initial rooms, divided by a timber wall, provided spaces for worship and education. The church continued to thrive with this important community support. The job of grave digging, for example, was still carried on in a voluntary capacity well into the twentieth century. Ebenezer Church remains Australia’s oldest surviving place of worship still in use. 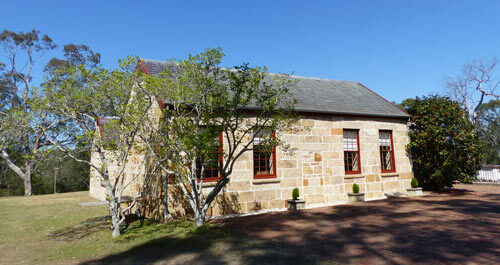 This solid, sandstone building has played a significant role in this little community. It has brought comforting familiarity, strengthening the community through well-known and loved practices of religious faith. This modest ‘house of God’ continually reminded them that they were not alone in their lives on the Hawkesbury. 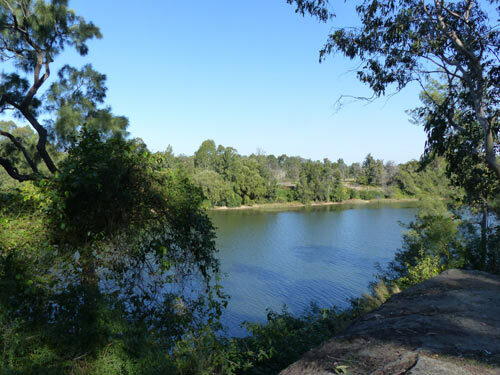 Throughout Ebenezer’s history the Hawkesbury River has played an important role as a travel route, especially before the first roadways. Many of the church members came to the services by boat. In the 1950s my family would sometimes venture to the fringes of Sydney with Ebenezer Church as the destination. Memories of these Sunday family picnics are still very special. Even to a young child, the tranquility and picturesque character of this place was not unnoticed. The river that flowed beside the church grounds was a magnet for any young person. I remember being told about the funerals that came by water, for it was not uncommon for these sombre processions to use the river. On 26 January 1929, the Sydney Morning Herald, while reporting on the addition of the porch to the church, described one such funeral. The rustic, solemn scene depicted was peopled by characters who would not have been out of place in a Max Dupain photograph. Over the years, this little, stone church has undergone renovation, extension and the addition of several new buildings. One of the latter is the Schoolmaster’s House, built around 1817. Partly surrounding the church is the well-cared for cemetery. 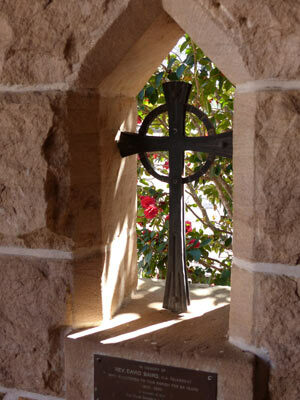 Many people, significant in the church’s and indeed Australia’s historical narrative, are buried there. As L.M. Cooper expressed in his poem Ebenezer, their ‘grey bones … wash about in memory’. This richly apt image reminds me of the initial, risky voyage across vast oceans, bringing the first settler families to Ebenezer. The area has a rich shipbuilding heritage. I also remember the threat posed by flood waters, over the years, to this faithful, little community. Evidence of how high these dangerous floodwaters have reached is marked outside the Schoolmaster’s entrance doorway. At the entrance to the church grounds, a small plaque hopefully catches the visitor’s attention and occasions reflection. Unveiled in June 2008, the church’s two hundredth anniversary year, the plaque reminds us that this is Dharug land. To my knowledge there are no recognised Dharug descendants buried in the cemetery or mentioned on the church walls. When I first visited as a child in the 1950s, I was oblivious to any indigenous presence in this region. I was unaware of their significance in the narrative of settlements like Ebenezer. Thankfully this is now changing. A visit to Ebenezer Church and surrounds is highly recommended. The role of volunteers still lives on there. Unlike most churches nowadays, you will be delighted to find this church’s doors open nearly every day. A welcome Devonshire tea is also available and can be enjoyed under shaded pergolas. From there you can keep an eye on the stately old gums that stand below on the Hawkesbury River banks.